St Giles, Birtley stands high above the North Tyne – we crossed the bridge at Wark, crossed the old line that used to run north to Riccarton Junction – I have just typed that into google to check the spelling, and got “junction near Riccarton” and a link to the Punjabi Junction restaurant in Edinburgh. Isn’t the internet marvellous! Apparently there is a metal roadsign in Birtley still pointing to “Wark station” (I must go and look for it). 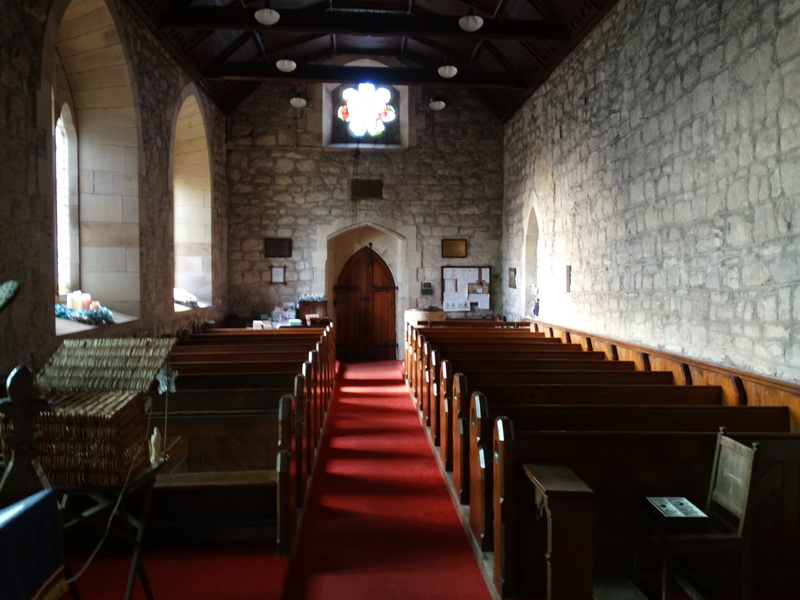 The church is in a group with Chollerton and Gunnerton. It is on the right as you enter the village – at NY878779 – there is a rather splendid War Memorial by the church gate. 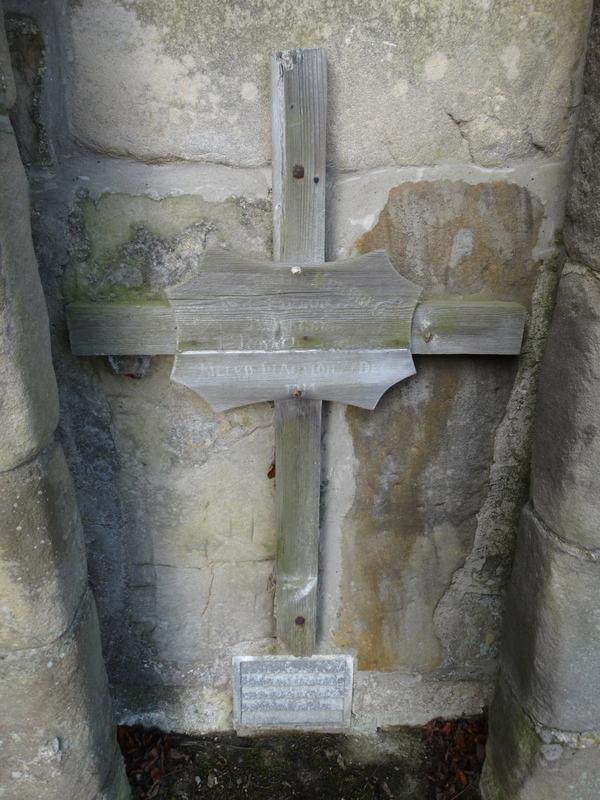 I have never seen a marble Latin cross with the rife in front – the nine WW1 names are on the front, the one from WW2 is on the side. 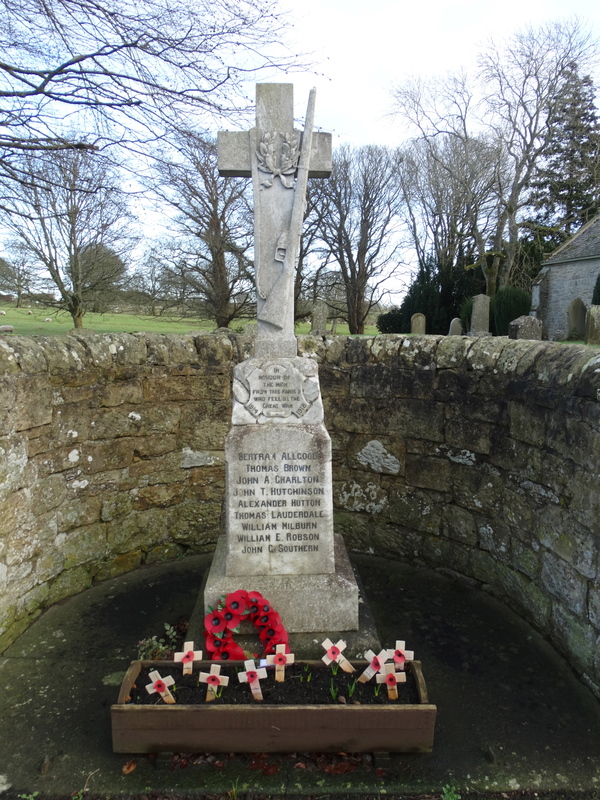 This memorial, and the others in the church and churchyard are detailed at www.lostancestors.eu/memwar/B/Birtley.htm. 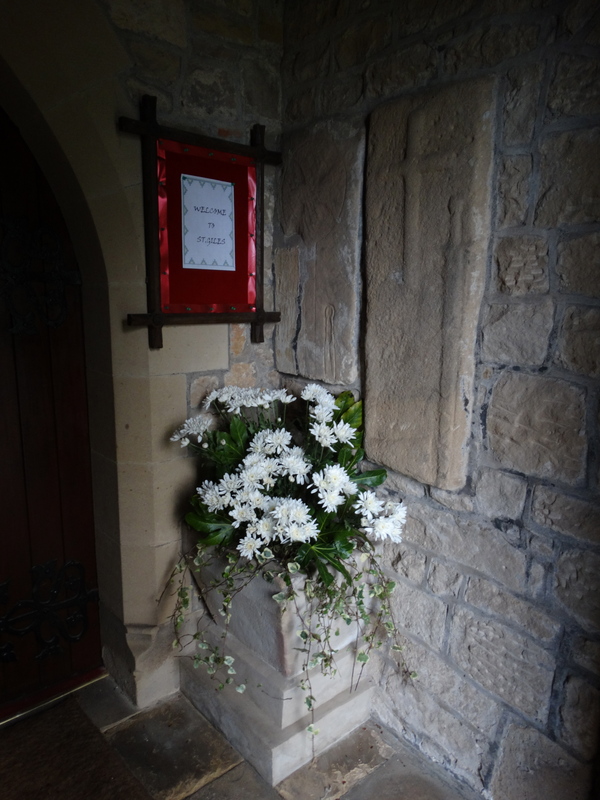 Walking round the outside of the church, there is an original wooden cross in an alcove on the south side. “Erected to the memory of Captain B. Allgood 1st Royal Irish Rifles Killed in action 7th December 1914”. 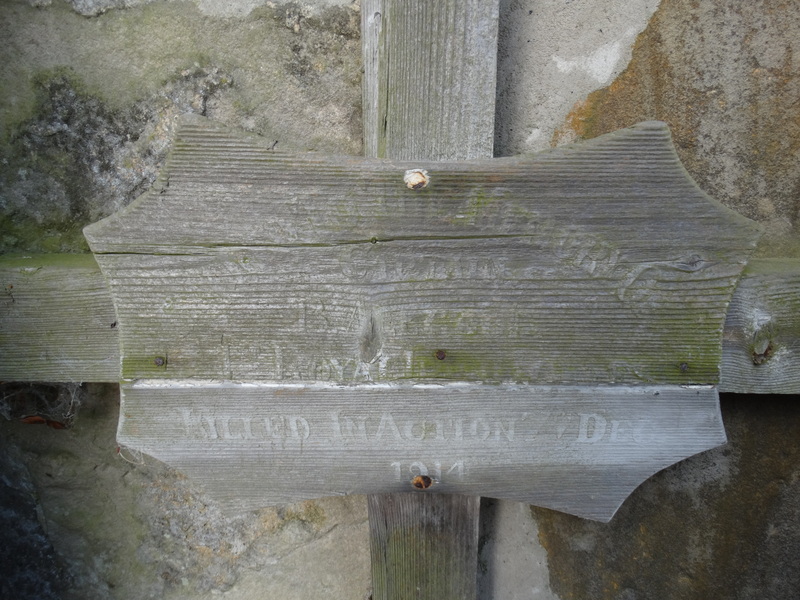 I don’t know why this wooden cross came home – it would be fascinating to know more. I have a lot of respect for the Commonwealth War Graves Commission, and am currently reading a wonderful book Remembered: The History of the Commonwealth War Graves Commission, good text by Julie Summers and stunning photos by Brian Harris. It is an amazing story – I hope someone tells it over the next few years. 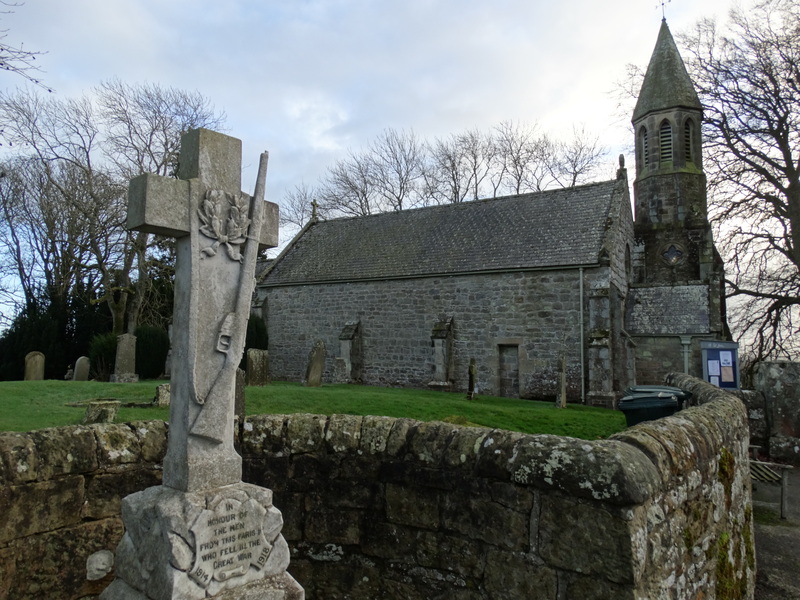 I do wish the Church had got its act together to tell some of the amazing stories of WW1 courage that are recorded in our churches – individual parishes have done well (remember St Cuthbert, Blyth), but there seems to have been little national or diocesan organisation. 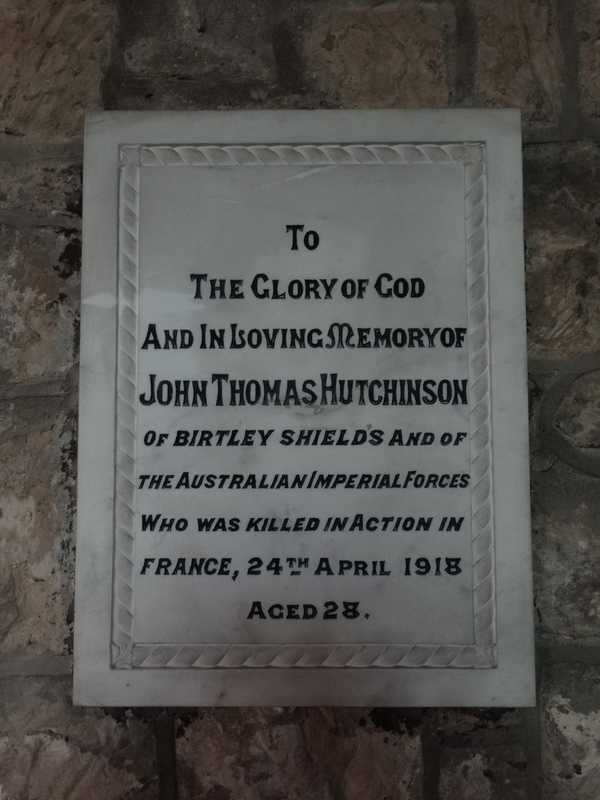 Inside the church there are other war memorials – why was John Thomas Hutchinson in the Australian Imperial Forces? 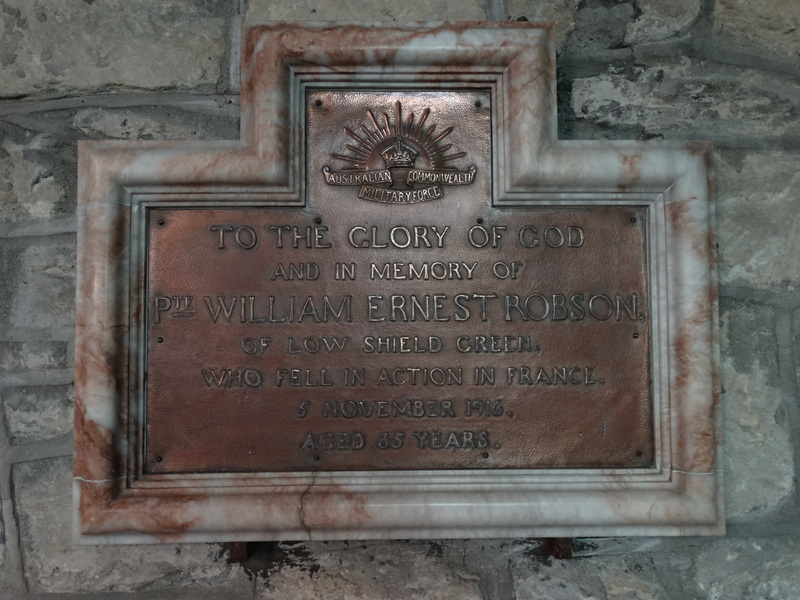 There is another to William Ernest Robson, what did he do in France? 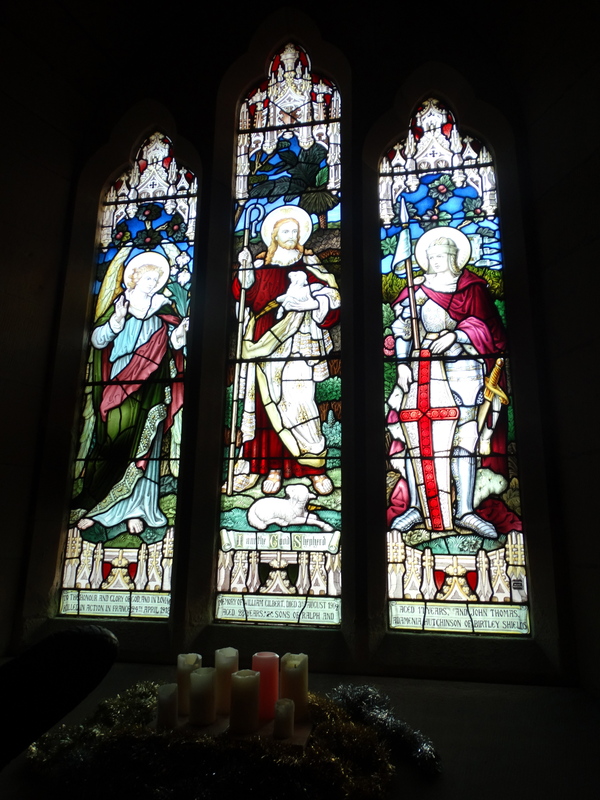 There is a window “To the honour and glory of God, and in loving memory of William Gilbert, died 3rd August 1902, aged 17 years, and John Thomas, killed in action in France 24th April 1918, aged 28 years. 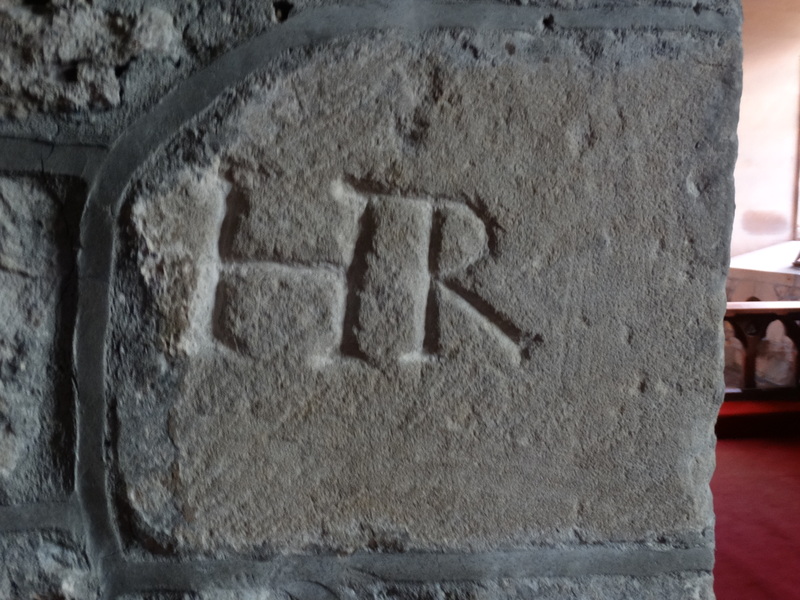 Sons of Ralph and Adamenia Hutchinson of Birtley Shields.” I have never come across the Christian name Adamenia before. I googled it and got no hits. Let us look at the church itself. 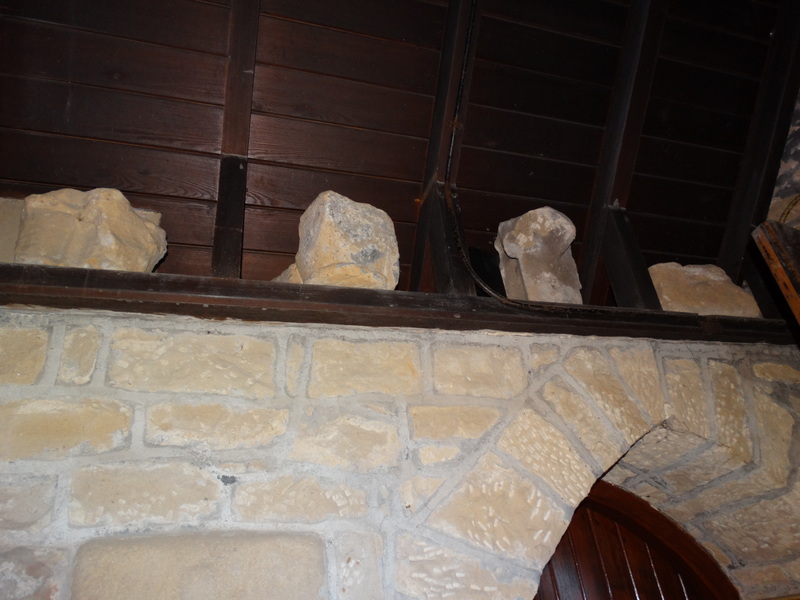 There may have been a Saxon church here, but the current building has Norman roots. There is a lot of Norman masonry in the North Wall – a north wall with no windows (it gets a bit windy up here). 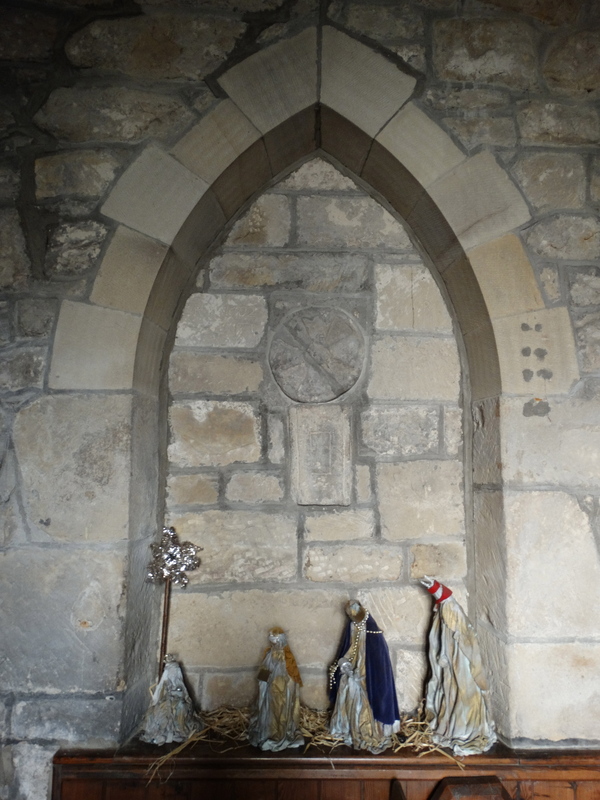 The chancel arch is also Norman. 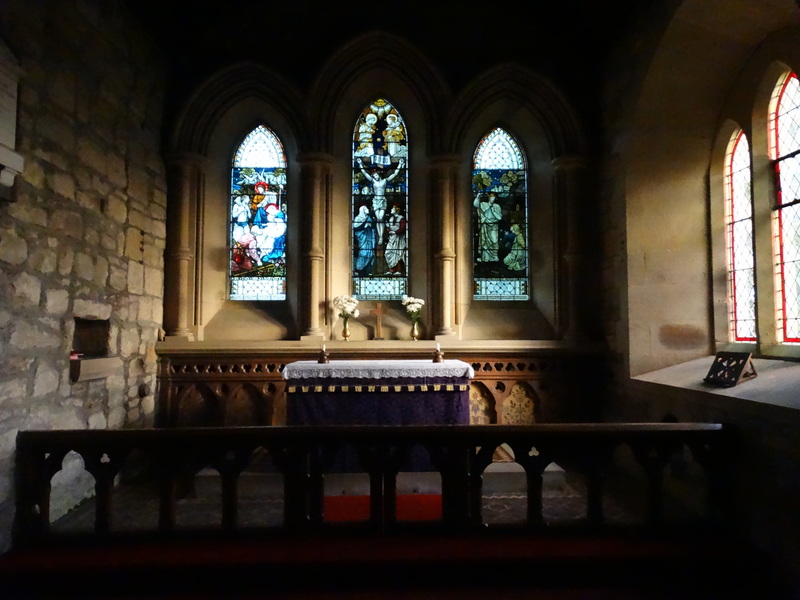 The Umfravilles were Lords of Prudhoe and Keepers of Redesdale, it was them who built the church about 1100, and in the next century it was handed to the Prior and Convent of Hexham for religious administration, but the maintenance of the fabric rested with the “possessor of the Great Tithes”, the Lord of the manor of Chipchase. 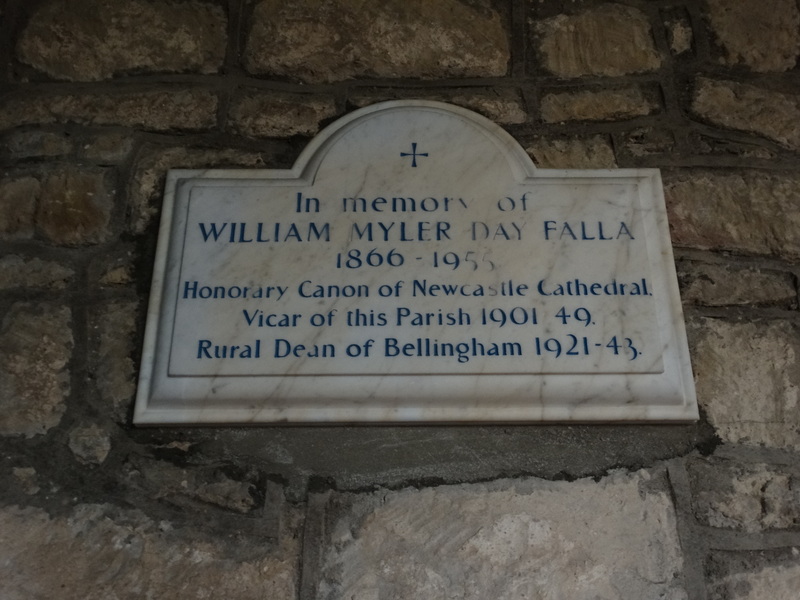 The frequency of raids from across the Border meant that little repair work was done and in 1610 the church was said to be “ruynouse and lying down”. It wasn’t until 1723 that the church was “coarsely rebuilt for present use” and Sir Cuthbert Heron, Lord of the manor of Chipchase, left “£40 per annum for performing divine service and preaching Christmas Day, Good Fryday, First Sunday after Midsummer and First Sunday after Michaelmass, which is now done.” I wonder who HR was. 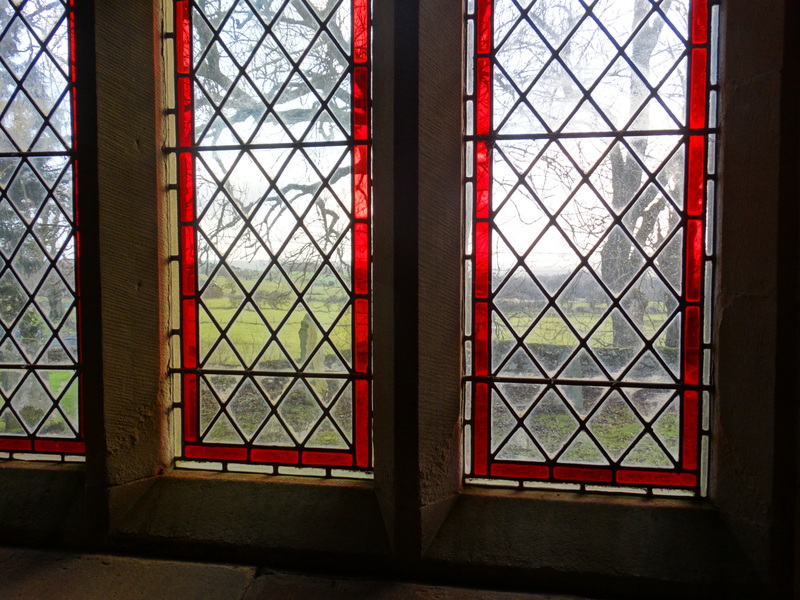 In 1883-4 there was a major renovation, with the cost of £1,350 raised locally. Everything ancient was carefully preserved. 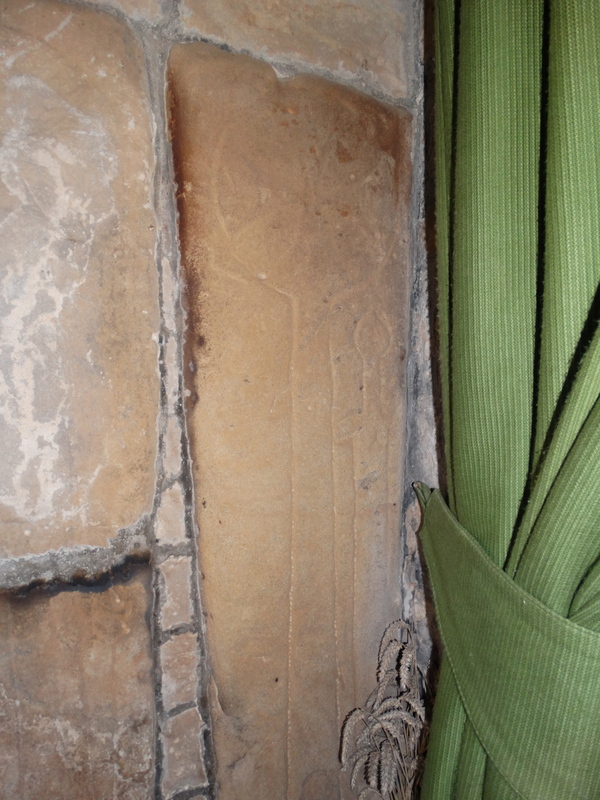 The Saxon grave covers bearing designs of crosses, swords and shears found in the foundations were built into the wall of the new porch. 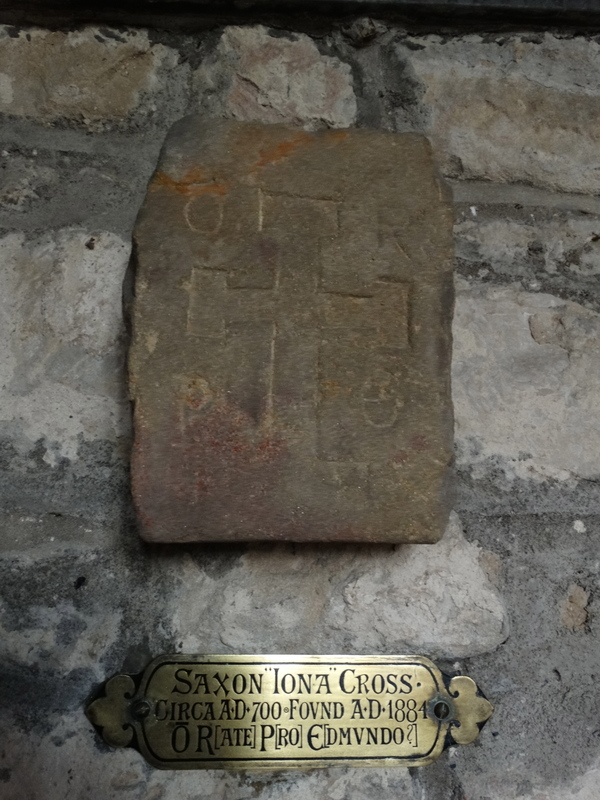 The Saxon burial stone which is built into the north wall of the Chancel bears an Iona cross, dated 700, and carries the inscription ORPE, probably standing for Orate Pro Edmundo, Pray for Edmund. 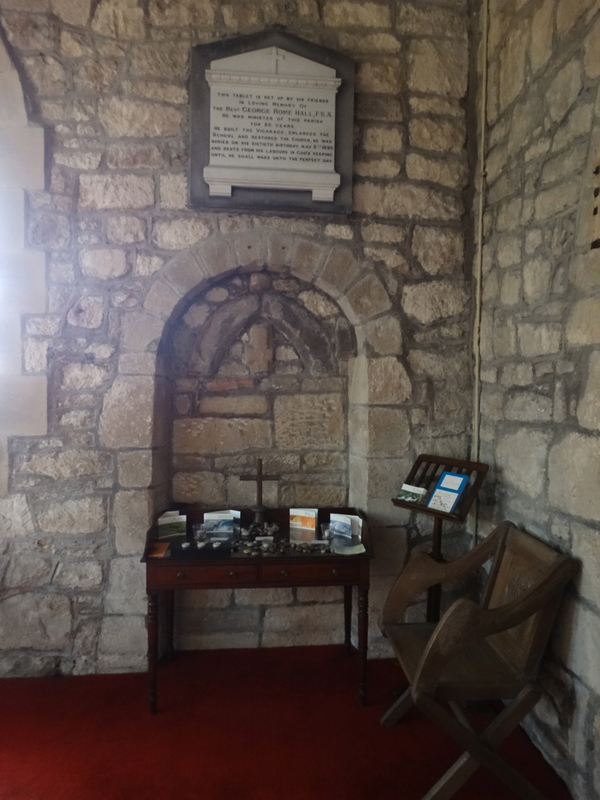 In the Chancel there is a fascinating C16 door – the guidesheet makes a comment that before the Reformation the priest (a short priest?) would appear through the door – later he would come to the altar through the people. 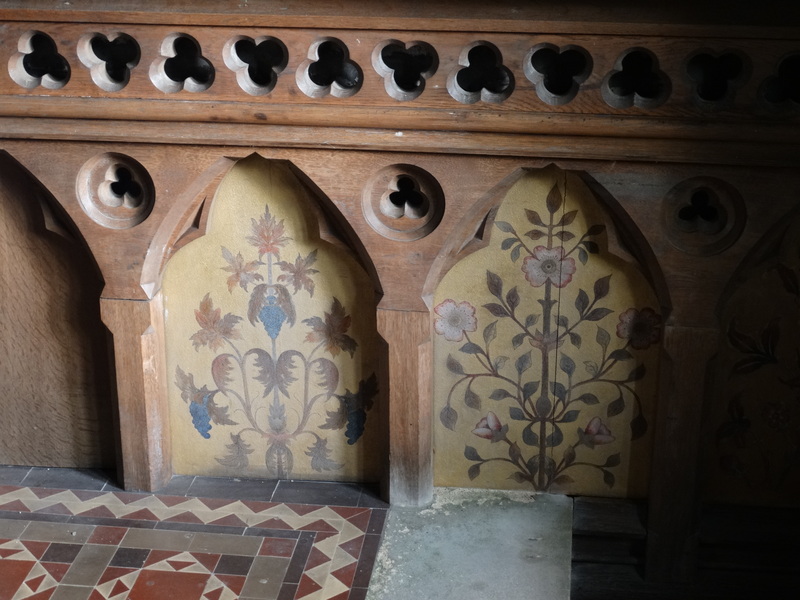 Some rather nice painting by the altar, and nice views through the windows. 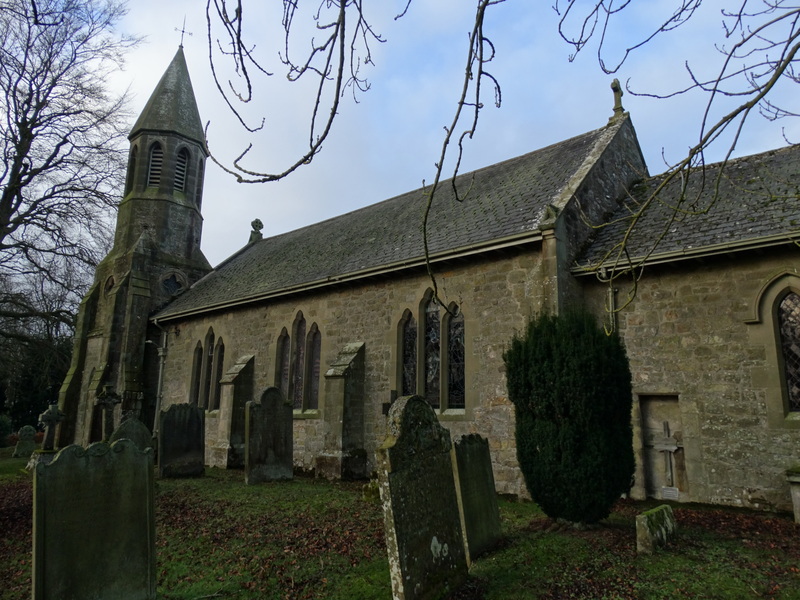 Imagine being Vicar here for 48 years – just this parish? 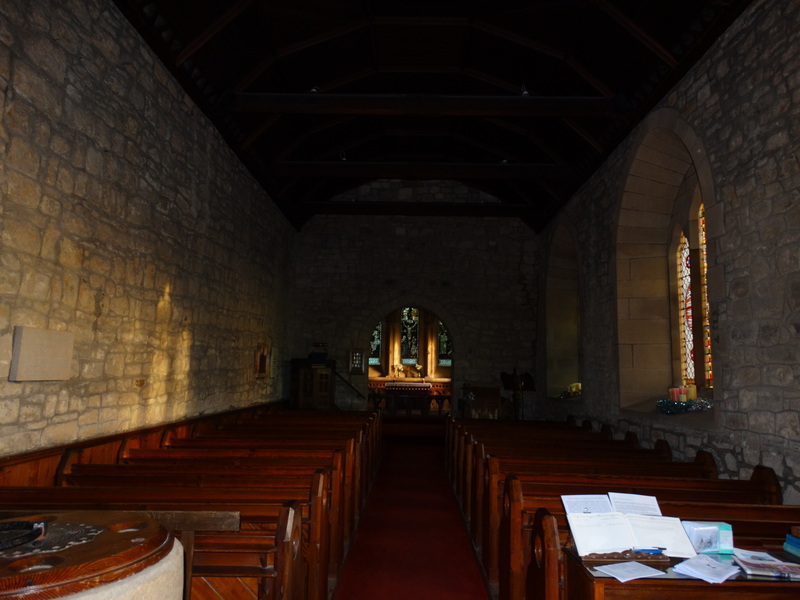 Worth looking west – a nice little church. 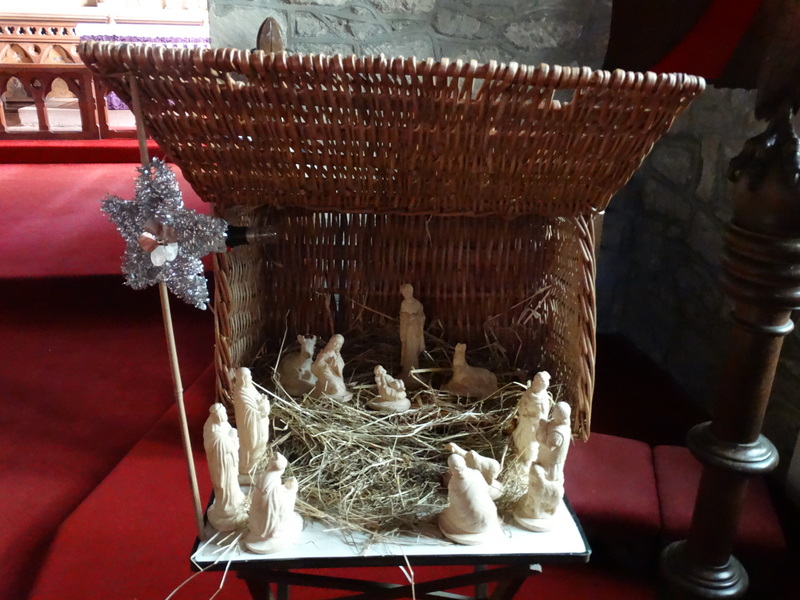 I like the Magi in one archway, just behind the font, and a rather nice Nativity. I wonder how many Christmases have been celebrated at the top of this hill. This entry was posted in Northumberland, Outside Northumberland, World War 1. Bookmark the permalink. Great report Peter, and, as usual, you pose a few questions ! which answers one of them ? I have found this post after searching for Ralph Hutchinson, the one mentioned in your window photo. I have found an old family bible originally belonging to Mary Hutchinson, the mother of the Ralph Hutchinson named in the stained glass window. I would love to trace a living relative to return the bible to the family. Ralph was born in 1836 and married Adamenia Reed. They had at least 4 children George c.1879, Elizabeth c.1879, William c.1885 and John Thomas c.1889. The latest I have found is an entry in the 1911 census which shows Ralph as a Farmer in River Hill, Barrasford. There are other lines from Ralph’s father: Ralph Hutchinson senior b.1790 but I’ve drawn a blank with them all so far. Are you aware of any further ancestors or anyone who may have researched Hutchinsons in the area?